Wally Crouter was 92. He was the morning man at CFRB 1010 for 50 years, from November 1, 1946 until November 1, 1996. There are a number of changes in Toronto's radio market, so let's run them down here. We'll start with the announcement that came as no surprise. Darren B. Lamb, who recently left Roger Ashby and Marilyn Dennis at CHUM FM, replaces Mike Cooper as Erin Davis's co-host during CHFI 98.1's morning show. They're calling it Erin & Darren In The Morning. They also unveiled their new logo. At the station formerly known as Flow 93-5, they've re-branded as 93.5 The Move. They'll play rhythmic hits from the 1990s and 2000s, along with current material. Here's their new logo. They also fired all female on-air talent ahead of the re-launch. Meanwhile, over at 102.1, they announced last week that they're bringing in Rick "The Temp" Campanelli as the newest addition to their morning show, but he won't join Fearless Fred and Mel until late June. Carly Rae Meyers has left X92.9 in Calgary for the midday shift at 102.1 the Edge. Wade McNeil is leaving his evening shift, Adam gets the afternoon drive slot and Kid Craig gets eventings. I'm told more changes are coming here, so stay tuned. If you heard episode 152 of my podcast with Pete Fowler, you heard me read the memo issued by Edge PD Stu Meyers about Martin Streek dropping an F-bomb on-air. Stu Meyers is Carly Meyers's father. And finally, all the Newstalk 1010 shows you enjoy weeknights from 10pm to 2am are either being shuttered or moving so they can bring you a new show featuring David Eddie. That means goodbye (or see you later at another time) to The Late Shift with Gail Vaz-Oxlade, The Late Shift with Joe Warmington, The Late Shift with Bill Hayes and The Late Shift with Taggart & Torrens. Let me know in the comments what you think of these moves, if you think about them at all. It's official. TSN 1050 Toronto has announced their new daily lineup and (gasp!) they gave a show to a woman! Here's the new lineup of shows and hosts on TSN 1050 Toronto beginning Monday, February 22. Dave Naylor and Michael Landsberg will be joined by regular Insiders and experts including James Duthie, Bob McKenzie, Darren Dreger, and Pierre McGuire. Andi Petrillo will host, and rumour has it she's a woman. Co-hosts will include Bob McKenzie, Darren Dreger, Pierre LeBrun, Craig Button and Dave Poulin. Mike Richards leaves the mornings for this, less desired, shift. Bryan Hayes, Jamie 'Noodles' McLennan, and Jeff 'The O’Dog' O’Neill will anchor the show that will go head-to-head against Bob McCown's Prime Time Sports. Good luck, guys. Rogers Media said they were cutting 200 jobs this quarter. They started last week, promising to finish as soon as possible, and today they delivered pink slips to two popular Fan 590 personalities. Gone are Greg Brady from Brady & Walker and longtime utility host Jeff Sammut. It looks like 590 will air a show entitled Sportsnet Today The Andrew Walker Show from 1-4. No word yet on whether Sportsnet Today includes Andrew Walker, although that's highly likely considering he's still employed by the station. Greg Brady visited my home on May 14, 2014. 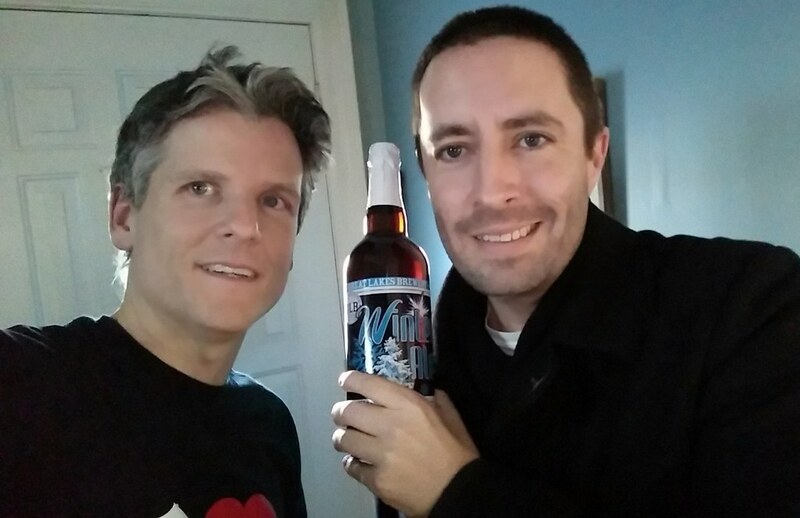 He appeared on episode 76 of my podcast, Toronto Mike'd, and he was entertaining, honest and an ideal guest. Part of what I like about Brady is that he doesn't pull punches. During this episode, he was brutally honest about why it didn't work out with former co-host Jim Lang. Recently, he went off on TSN Radio, which caused Mike Richards to strike back during his episode of Toronto Mike'd. Brady was always honest, perhaps too honest, but it made for interesting radio. I knew Brady had rode in the Ride to Conquer Cancer, so when I was training for my first ride, I'd call Brady up and grill him with questions. He was very helpful. Here's episode 76 with Greg Brady, if you missed it the first time. Jeff Sammit visited my home on December 11, 2015. He appeared on episode 149 of my podcast, and it was a pleasure. When we finished recording, I looked at the software and saw it had crashed at the 1:02 mark. Luckily, I didn't lose that 1:02, but I had an episode without an ending. He was more than happy to re-record our last bit about his love of the Yankees and I learned a valuable lesson about recording software. Here's episode 149 with Jeff Sammut. This is a terrible time for members of the mainstream media. There are few options, and everyone is cutting staff. If it's not Bell Media or Rogers Media announcing cuts, it's Corus or CBC or Postmedia. Heck, CHCH fired everybody, just ask Mark Hebscher. Few are safe, job security is rare and good people who do good work are reduced to expendable numbers. What an unfortunate state of affairs. In this 157th episode, Mike chats with CFNY's Ivar Hamilton about his days at the Spirit of Radio, his memories of Martin Streek, how he was responsible for the Bon Jovi banner at the ACC and what he and David Marsden are up to these days. This episode is exactly 1:44:47. I tweeted this news yesterday, but only a handful seemed to notice. So it's time to kick it old school with a blog entry. Bill Carroll's contract at KFI AM 640 in Los Angeles recently lapsed and this Friday will be his last day at Talk Radio AM640 here in Toronto.He's moving on to another gig, although not in Toronto. He'll be heard on Newstalk 580 CFRA in Ottawa. It was a little over three years ago that Bill Carroll announced his return to Toronto radio. I know him best as host of Barometer on Q107 back in the day, but he also spent time at the old TALK 640 and 1010 CFRB. When a Bill Carroll fan page on Facebook picked up my tweet earlier today, Bill's wife Sylvie Lapointe all but confirmed the news. Here's audio of Bill Carroll signing off for the last time. I received an email from a reader named Billy who has a question for the hivemind. What is the more impressive line up? CFNY 102.1 The Edge circa 1997 or the 2015 Toronto Blue Jays? Leave a comment with your vote! I used to listen to Mike Cooper on 680 CFTR. I'm too young to remember the heydays of CHUM. Legend has it the man rode a ferris wheel at the CNE for 21 days. This past decade, Coop has co-hosted with Erin Davis, first at EZ Rock and then at CHFI. 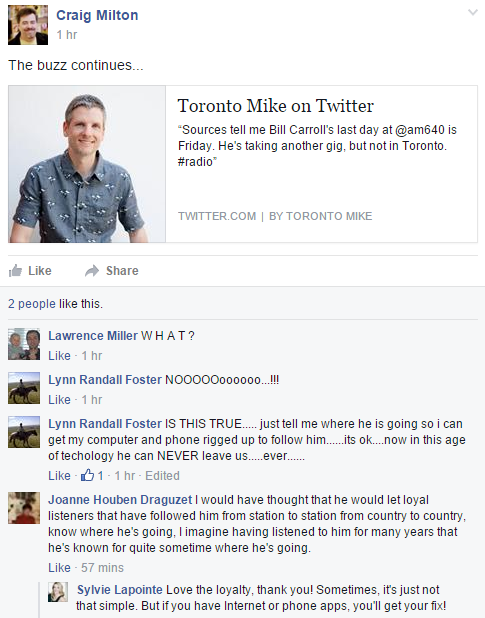 Regardless of your age, you likely remember Mike Cooper on Toronto radio. 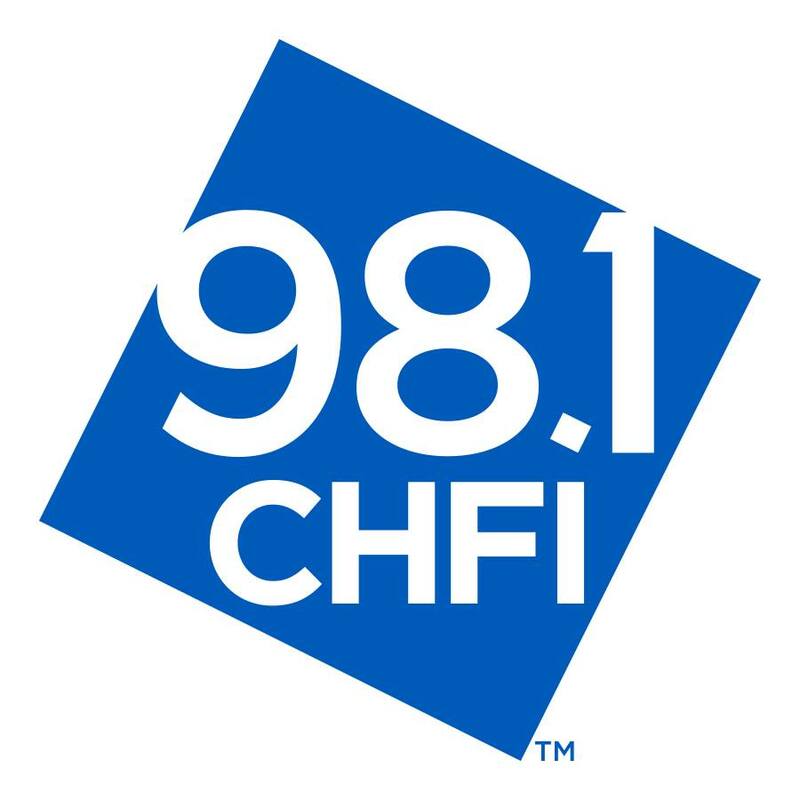 Coop is signing off as co-host of 98.1 CHFI’s Erin and Mike in the Morning on January 29, 2016. Here's why, in his own words. I’ve taken care of millions of people over the years and now it’s time to take care of one – my beloved wife and childhood sweetheart Debbie. It’s been an honour to be a part of the Rogers family at CHFI working alongside my dear friend Erin Davis for the past 10 years. Coop will be missed, but who will take his coveted spot alongside Erin Davis? Darren B. Lamb recently left the CHUM-FM morning show and promised he's resurface soon. This could very well be that. Erin and Darren has a nice ring to it. And of course Maddog recently showed up on-air at CHFI for the New Year's Eve show. He's a long-time Toronto morning man without a home. Speculate with me and share your Coop stories below. Meanwhile, here's some classic Cooper from his CFTR days. I'm hoping to get him on Toronto Mike'd for a proper send-off! Update: It will indeed be Darren B. Lamb replacing Mike Cooper on the new Erin & Darren In The Morning on 98.1 CHFI.